When I fixate on something I tend to fixate. Right now it's sweet potatoes. Ever since I roasted them in the oven for Thanksgiving I can't get over how much richer they taste than when they're zapped in the microwave. And as good as they are mashed with orange juice, dried cranberries and brandy, I've been trying to think of some other uses for them. I don't know how you feel about the FoodTV Network. Me, I have this love-hate thing going with it. There are some good shows (although most of the really good shows where the hosts actually seemed to know what they were doing and would actually cook and from whom I learned something are gone), but mostly it's all fluff and infomercials (like "The Secret History of . . .," "Unwrapped," and most of the specials) that promote unhealthy, processed, packaged foods. It's usually on in the background when I'm home, but I don't pay much attention to it and will run to change the channel when Bobby Flay or that obnoxious guy who hosts the Top Five show or that other obnoxious guy who hosts "The Secret Life of . . ." come on. I can't believe I'd ever see the day that I'd say I miss Gordon Elliott (at least in comparison to those three), but there you have it. And every once in a while I'll get an idea from someone, which happened Thanksgiving weekend. The theme for the day was how to use up all the Thanksgiving leftovers, and Michael Chiarelli made a pasta dish with sweet potatoes. Which got me thinking . . .
. . . and led to Whole Wheat Couscous with Sweet Potatoes and Zucchini. This is mighty tasty, and doesn't take too long to prepare, assuming you already have the roasted sweet potatoes. And now that I've discovered how much better they are oven-roasted, I plan to always have some handy. 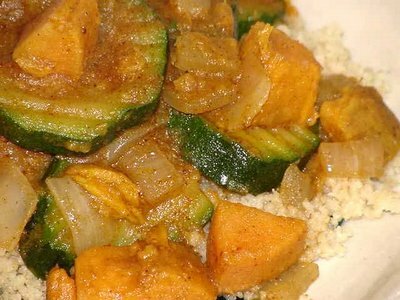 You can pretty much cook up the sweet potatoes and zucchini in the time it takes to make the couscous, which always makes life easier. Frozen zucchini makes this a truly convenient dish. Prepare couscous according to package directions, using stock instead of water. At the same time, heat oil in medium sized skillet. Add onions and cook until translucent, about 5 minutes. Add spices and cook until fragrant, about 1 minute. Add 1/2 cup stock, sweet potatoes, and zucchini. Add salt and pepper. Simmer until heated through, mashing up a few of the sweet potato cubes to thicken the sauce.